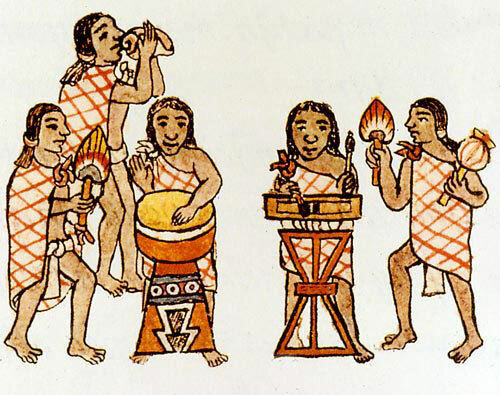 They were usually played together, leading the rhythms at the centre of all the big Aztec ceremonies and festivals in the great central courtyard of Tenochtitlan. Hollowed out from logs of hardwood, these drums ranged from 25 cms to a full metre in length. Cut into the top were two tongues, both the same length but of different thicknesses: this gave the drum its special two-toned (‘dual pitch’) sound. 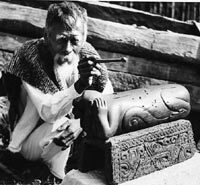 Carvings on teponaztlis were usually of sacred creatures and warriors. 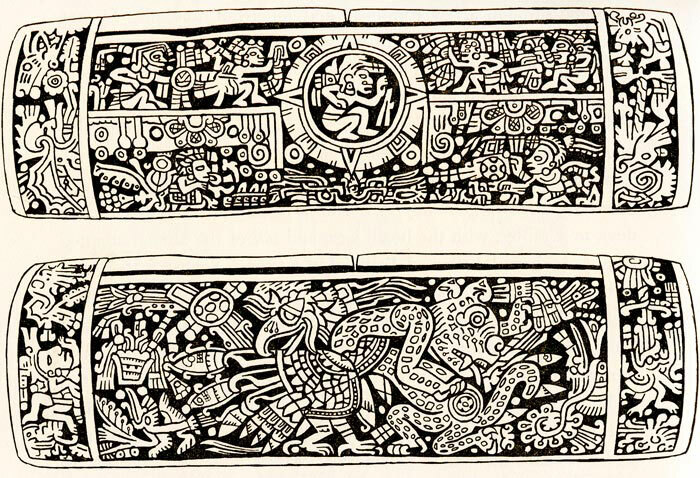 One in the British Museum has an owl in the middle, showing the purpose of the drum itself: the owl for the Aztecs was a messenger between humans and gods. 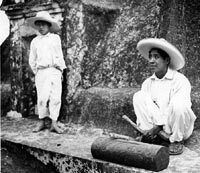 There are still a few jealously guarded original Aztec teponaztlis in Mexican villages that are brought out and played for local festivals perhaps once every year. Click at the bottom of this page to hear how teponaztlis sound! Q. 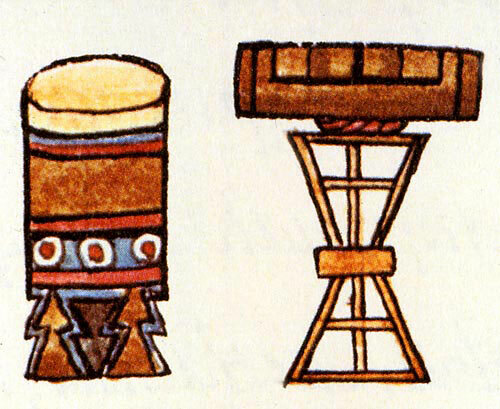 Why was the teponaztli twice as precious as other drums? 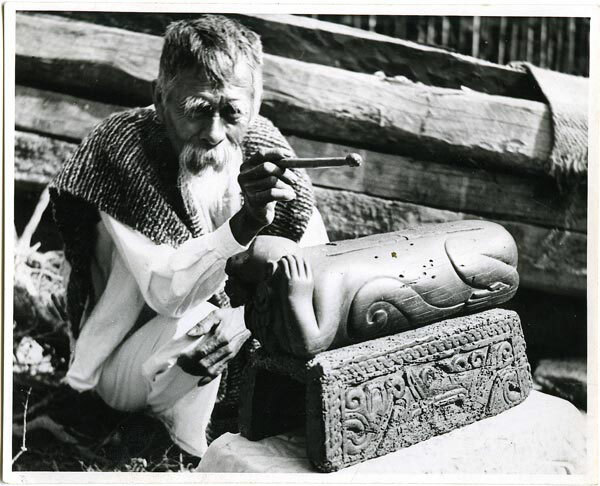 ... in the collections of the Phoebe A. Hearst Museum of Anthropology. 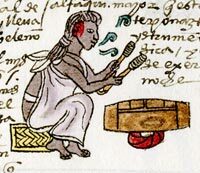 If the large vertical huehuetl drum was the ‘king’ or ‘alpha’ of Aztec musical instruments, the horizontal teponaztli (Náhuatl root tepontli or log) was the ‘queen’ or ‘omega’: usually played alongside each other, both were believed, according to legend, to have been gods banished to earth in the form of drums. 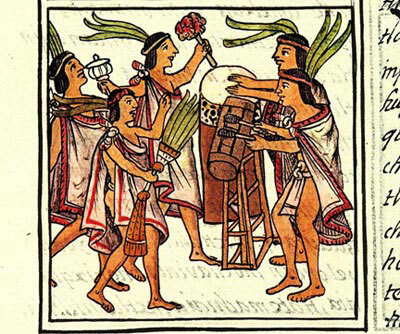 As such they were sacred, and led the rhythms that formed a crucial part of all major Aztec ceremonies and festivals in the great central courtyard of Tenochtitlan. 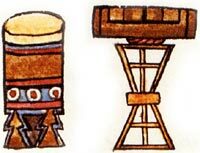 Made from hardwoods, hollowed out using hot metal pieces to carbonise the wood (and then allow it to be scraped out), these drums ranged from 25 cms to a full metre in length. The beaters were wooden mallets (called ‘olmaitl’ or ‘rubber hands’) tipped with heads of gum resin. 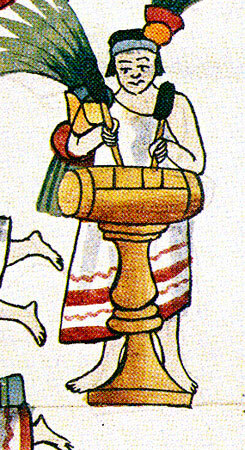 For better resonance the player usually rested the instrument either (in temple rituals) on a reed ring called a ‘throne’ (’icpalli’ - a word usually reserved for the special seat of someone in high authority) - or (in ceremonial dances) on a wooden stand at waist height: or indeed, on both (see Pic 1). 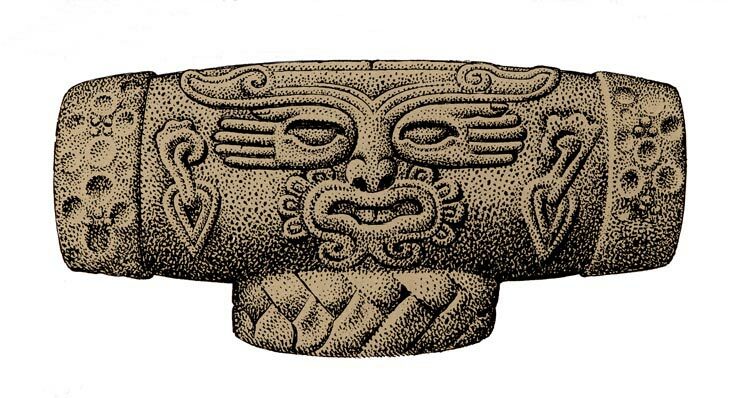 Carvings on teponaztlis were usually of sacred creatures and warriors (as opposed to those on vertical huehuetls which often consisted of ritual symbols such as warfare). 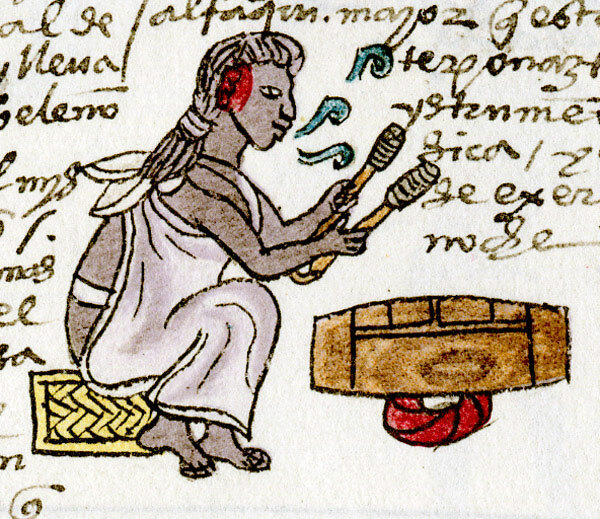 One of the teponaztlis in the British Museum has an owl prominently carved in the middle of the instrument: in this case the carving hints at the very purpose of the drum itself, as the owl (tecolotl in Náhuatl) was believed by the Aztecs to be a night bird messenger between humans and gods. 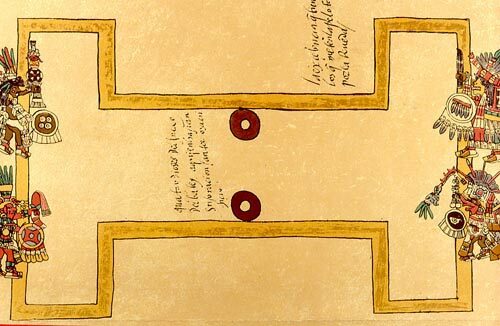 The H-shape of the tongues cut into the top of the drum reminds us a little of the shape of the ritual ball court, with its two opposite ends. 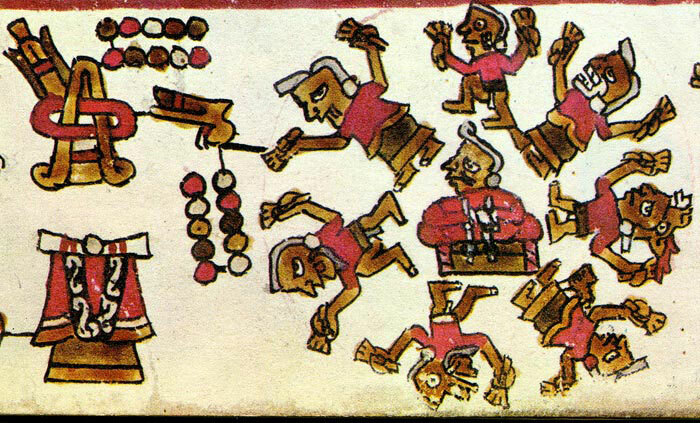 Some codex illustrations of teponaztlis (look at Pics 1, 2, 4, 10, for example) appear to show 4 tongues instead of 2: were these really instruments with 4 distinct keys (in which case the teponaztli would have resembled a simple marimba), or was it just the way the carver thinned the tongues, by cutting/scraping the outside surfaces, giving the optical illusion of separate platforms? No-one knows for sure. 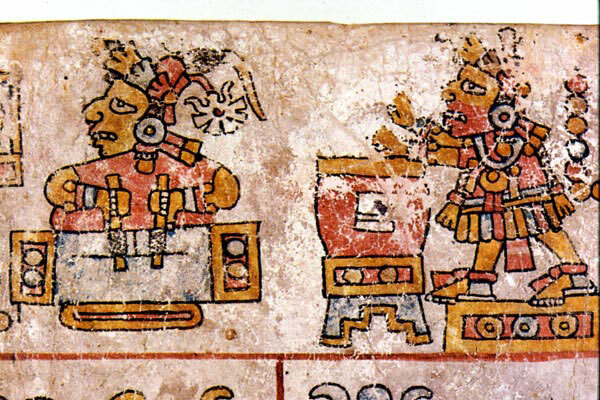 At all events, the two principal tongues produced (most agree) two different notes giving a musical interval of a minor third.Without any written records of musical notation, we’re left to make intelligent guesses from the few clues the Aztecs have handed down to us of exactly how they played their drums. One manuscript from the 16th. century (the ‘Cantares Mexicanos’) gives us a tantalizing hint, showing examples of a written rhythm notation using 4 basic vocal syllables (ti, to, ki, co), in which the ‘i’ may have meant a high pitch note and the ‘o’ a low one. What we do know for sure is that the teponaztli played a key role at the heart of all major Aztec festivals and ceremonies, pulsing out haunting and echoing rhythms designed to entrance musicians, dancers... and gods.This beautifully simple two-tone instrument is yet another example of the duality (in this case two contrasting pitches) that was central to Aztec myths and beliefs. 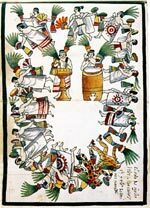 There’s very little evidence that the teponaztli was ever used in this way - as an alternative to the ritual sacrifice stone - and we ought to remember that Durán is the same chappy who gave us the notorious figure of 80,400 human sacrifices at one festival (all experts agree this has to be a wild exaggeration)! 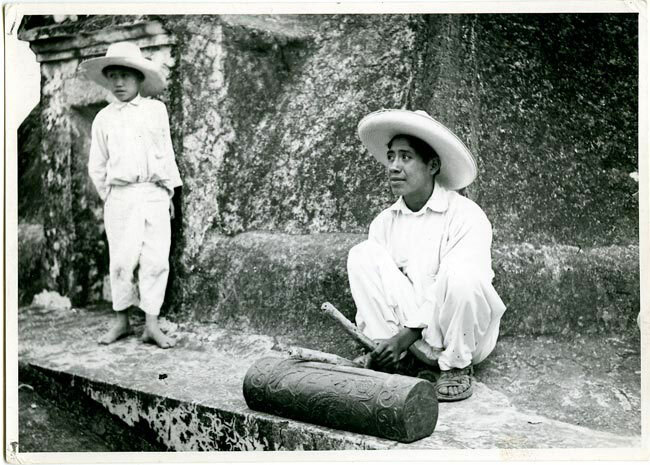 Several dozen real Aztec teponaztlis still survive today, in some cases having been passed down from generation to generation: the British ethnomusicologist Rodney Gallop found three jealously guarded pre-Columbian teponaztlis still being played in Mexican villages in the late 1930s! One was kept permanently with a lead round its neck (’to prevent it flying away...’). 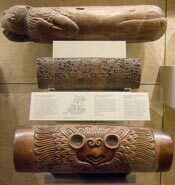 Carved of nut-brown wood and ‘of surprising weight’, the drum is decorated on one side with the figure of Xochipilli, ‘Prince of Flowers’ and god of music, dancing and festivity. 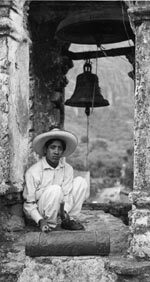 Still played twice a year for major community festivals, and believed to hold spiritual powers (not least for the 3 men in Tepoztlan privileged to be allowed to play it), the original is kept in a secret location in the town! 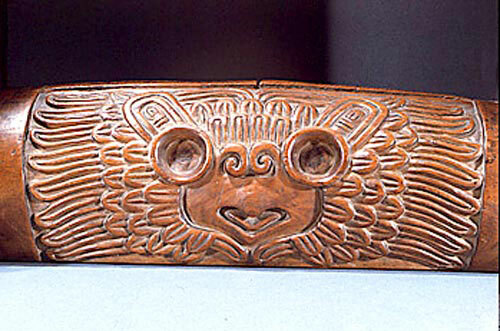 This fine replica (Pic 16) is viewable by request in the sacristy of the Church of the Holy Trinity on Avenida del Tepozteco. 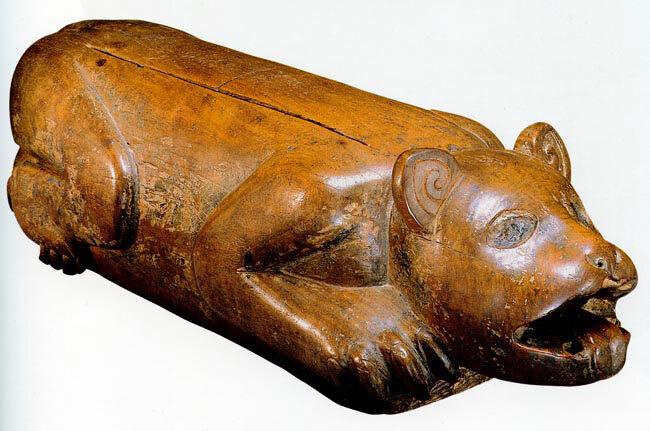 A few pre-Columbian teponaztlis came together in London for the major exhibition on the Aztecs at the Royal Academy that finished in April 2003, such as this fine example in the shape of a crouching jaguar (Pic 17); originally the jaguar’s face had inlaid eyes and fangs attached to its upper and lower jaws. It was bought by a collector in the late 19th. 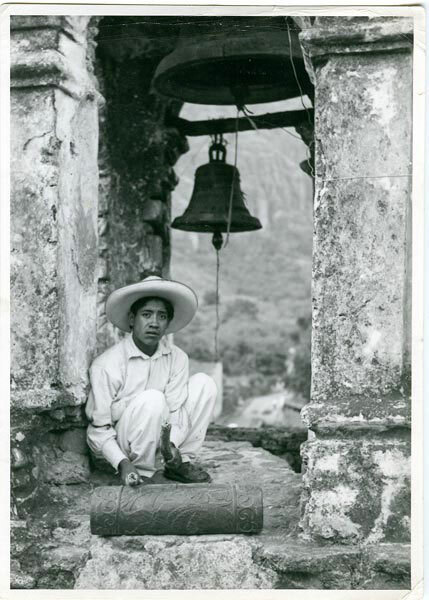 century in a town in Puebla state (where it was still being played in ceremonies and still considered sacred), and ended up in 1901 in the American Museum of Natural History, New York. 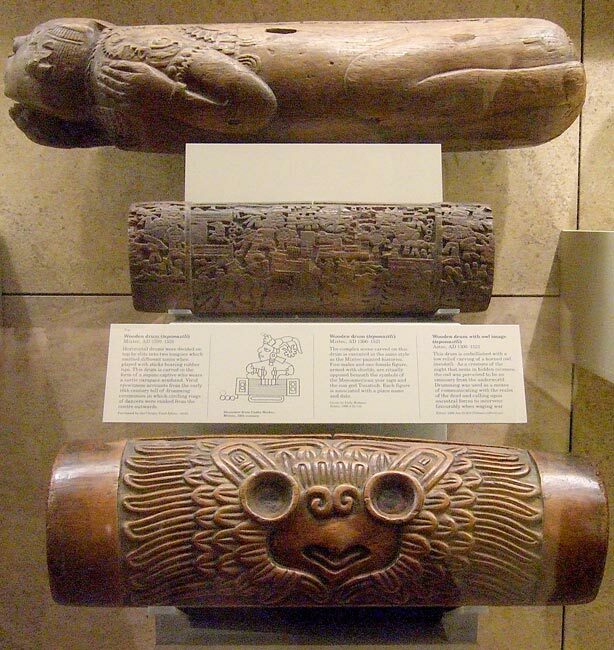 You can of course go to the Mexico Gallery of the British Museum to see (Pic 19) the 3 teponaztlis (one Aztec, two Mixtec) on display there, and there’s a copy of one in the Horniman Museum (but note our comments on it on our ‘Places to Visit’ page!) 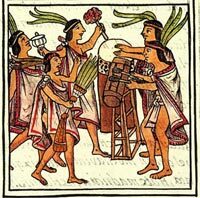 - or of course if you invite Mexicolore to your school you’ll be able to try playing some fine copies of Aztec teponaztlis for real ...! please Rodney Gallop bibliography ? Mexicolore replies: Good point! Sorry we omitted this key source. You need to get hold of ‘Mexican Mosaic’ by Rodney Gallop (Quiller Press Ltd., London, 1990) (original published in 1939). Hope this helps!